Do you love animals? 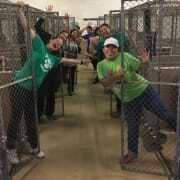 Do you want to help animal shelters in a flexible schedule? Then, this is for you! You will assist staff with sanitizing and maintenance of adoptable animals’ areas: assembling cleaning supplies, moving animals, cleaning/sanitizing animals pens, resetting cages with food, paper, toys and/or bedding, feeding and watering of animals and generally keeping everyone clean, dry & comfortable! You will also be able to assist in reviewing and reporting health status of animals.